Three people have been arrested in Nigeria for allegedly tying late students to crosses and flogging them with horsewhips on a Nigerian roadside. The three - including the headteacher - were taken into custody after a police officer stumbled across the incident in south-western Ogun State. 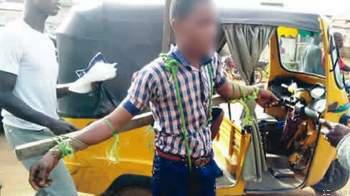 Pictures show at least two young people - one boy and one girl - tied to a makeshift crucifix with green string. A police spokesman described the punishment as "a barbaric act". Local reports say they were being punished for being late. The officer - named only as Livinus - tried to intervene, asking the school's owner to free the teenagers. When the owner of the school in Ayetoro, 145km (90 miles) north-west of Lagos, refused, the officer decided to take action - only to be forced back. "When I tried to untie the pupils, the proprietor and his teachers beat me up," he told Nigerian newspaper Punch. "Before I returned from picking handcuffs from my car, they had grabbed a friend who was with me... and beaten him up with a horsewhip."